Last chance to see “Impressionism,” Matt Connors’s show at MoMA PS1. 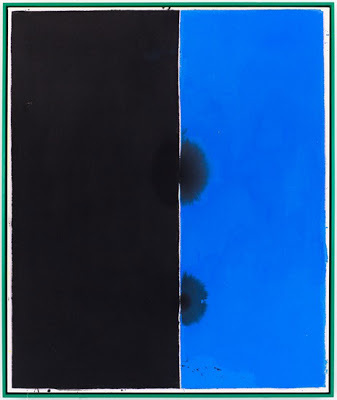 His paintings embrace and rethink all the physical tropes of abstraction, including oily pigment halos, AbEx scale, hard edge geometry, and Twombly-esque calligraphy, reformulating each in the artist’s own idiosyncratic, endearingly low-skilled way. The show closes today. 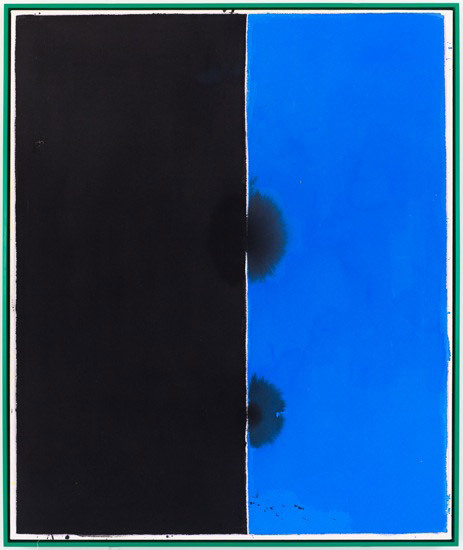 Image at top: Matt Connors, Black/Blue, 2012, acrylic and colored pencil on canvas with artist’s frame, 48 x 40 inches. 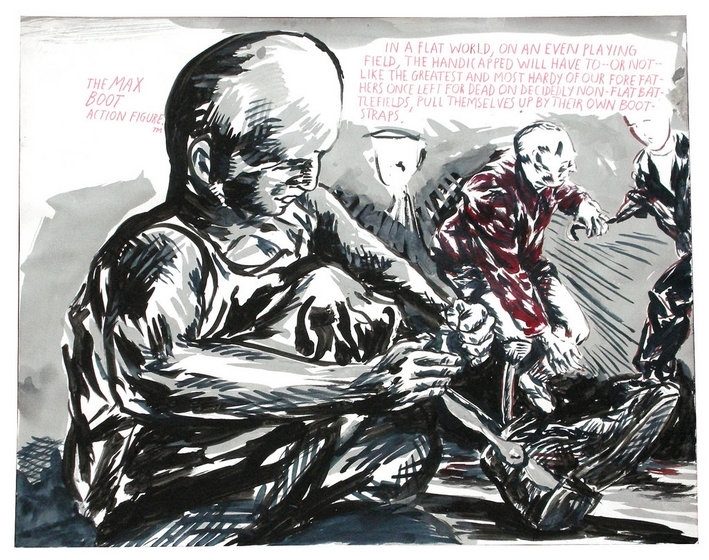 Image above: Installation view. 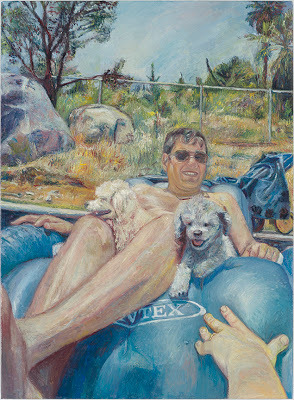 Keith Mayerson, Andrew and the Pups at the Pool, 2011, oil on linen, 30 x 22 inches. Over the holidays, painter and Columbia University MFA student Tatiana Berg has been entertaining questions on her Tumblr, so I asked what was the best advice she has received at grad school so far. “The best advice I’ve gotten probably came from either Dana Schutz, who I was assigned as a mentor and who I AM IN LOVE WITH, or Keith Mayerson who is an amazing, kindhearted person and incredibly dedicated teacher. I’m trying to think of what his best advice is; in my case he plays the important role of cheerleader who keeps me from being cynical or overly miserable about my own work. ‘Don’t swallow the bitter pill,’ ‘Don’t fall into the trap of production,’ ‘If someone rolls you a ball, pick it up and roll it back…'” Read More. Two Coats of Paint’s choice for Best Film of 2012 is “Amour,” a French film about two retired music teachers who live in a shabby, well-loved apartment full of intimate french landscape paintings, books, CDs, and prints. In the NY Times critic Manohla Dargis called the film “a masterpiece about life, death and everything in between.” Carefully observed, insightful and moving, “Amour” is one of those rare films that will make you look at life (and love) differently. Life is indeed beautiful. At the Film Forum and Lincoln Plaza. Save the Date: The College Art Association’s Annual Conference takes place at the New York Hilton, Wednesday, February 13, through Saturday, February 16, and artists should be aware that ArtSpace, a mini conference within the conference, is free and open to the public. Organized by CAA’s Services to Artists Committee, ArtSpace is tailored to the interests and needs of artists (as opposed to art historians). Check out the schedule of panels and discussions here. More details to come. 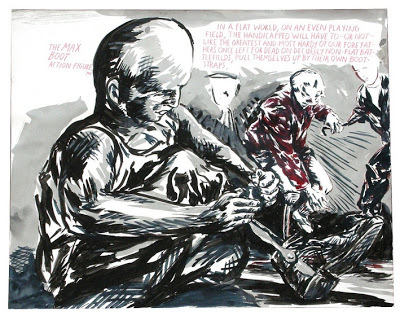 Raymond Pettibon’s advice to artists this week, via Twitter: “Spend the next 40 yrs wrkng 20 hrs a day on yr art like I have–and then ask me 4 advice on ‘how to make it.’ ” Image above courtesy of Pettibon’s website. What does "don't fall into the trap of production" mean?